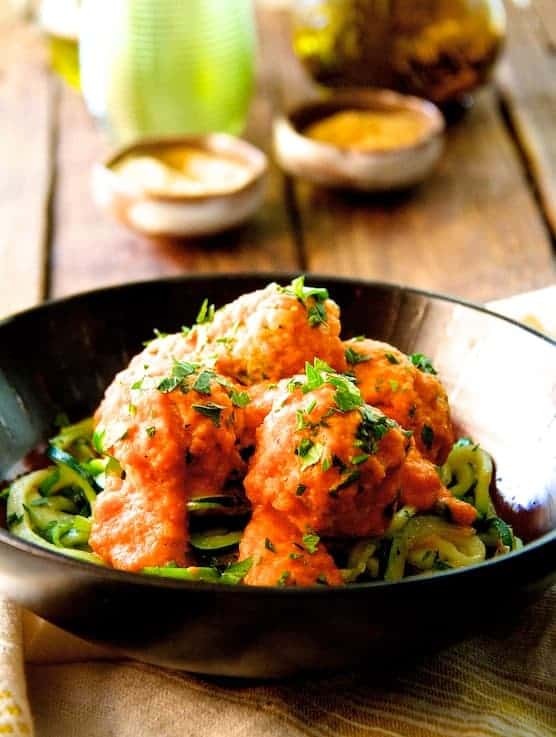 Spiced chicken meatballs are smothered in a flavor-packed roasted red bell pepper and chickpea sauce which are then served atop quickly sautéed zucchini “noodles” in this Middle Eastern twist on spaghetti and meatballs. Traditional Italian-style meatballs are often made with a combination of beef, pork and veal. Lighter all the way around than the traditional, these meatballs are made with ground chicken instead. Use all white meat, or if you’re not afraid of a small amount of extra fat, use a combination of white and dark ground chicken for better flavor. The combination of spices, cumin, coriander, Hungarian paprika and a touch of cayenne makes them irresistible! When making meatballs, get all the ingredients except the ground protein mixed together first, then add the ground protein last. This order ensures that all the ingredients and seasonings are more evenly distributed. When I mix up any ground protein dish, I put on disposable gloves and mix with my hands to get the job done faster and more thoroughly. The best way I’ve found to portion and form meatballs is with a 1-inch cookie scoop. After mixing everything together, grab a handful of it in one hand and the cookie scoop in the other. Use the heel of the hand holding the meat mixture to level off the scoop. Empty the scoop onto a baking sheet. After they are all portioned out, roll into neat balls. Frying meatballs is messy and requires more time and attention. Instead, I place on a foil-lined baking sheet, drizzle some stock or broth over them so they don’t dry out and simply bake in the oven. My favorite flavor of hummus–roasted red bell pepper–was my inspiration to create this sauce that pairs perfectly with the spiced chicken meatballs. If time allows, I prefer to roast my own red bell peppers for the best flavor. However, good-quality water-packed roasted red bell pepper in a jar is a fine substitute. Canned chickpeas (also called garbanzo beans), thicken the sauce while adding complex carbohydrates, fiber and iron. 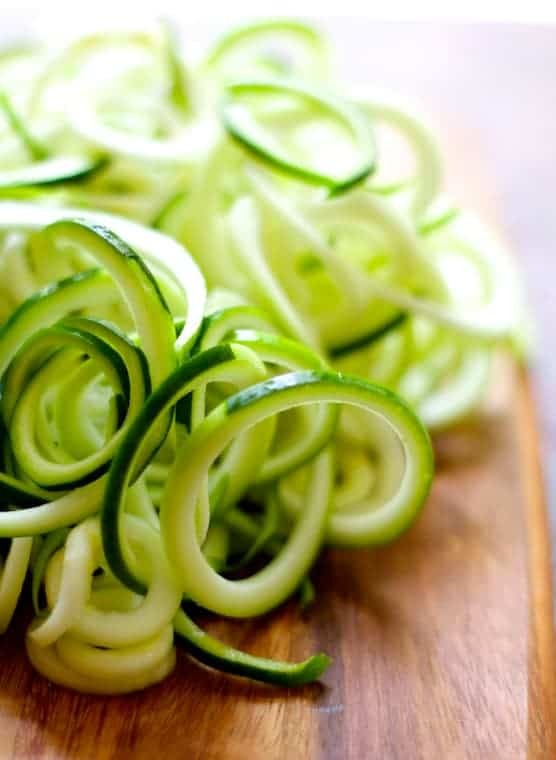 Vegetable spiralizers such as the Paderno Spiral Slicer and the Vegetti are two of the hottest gadgets to hit kitchens in a while. I haven’t tried the Vegetti, but the Paderno makes quick work of spiralizing vegetables. If you don’t have either one of these two gadgets, thinly slice zucchini the long way, then cut into noodle-like strips. The sauce is also delicious with regular pasta, rice and with roasted cauliflower. Preheat oven to 375 degrees. Line a baking sheet with aluminum foil and spray with cooking spray. Alternately, use non-stick aluminum foil or parchment paper. Combine next 11 ingredients in a bowl (using 1/4 cup chicken broth). Add ground chicken and mix well. Form into 1-inch meatballs and place on baking sheet. Drizzle with remaining chicken broth. Bake for 15-20 minutes or until cooked through to an internal temperature of 165 degrees. Makes 25 1-inch meatballs. While the meatballs are baking, prepare sauce. Heat olive oil over medium-high heat in a large saucepan. Add the onion, reduce heat to medium-low and cook 8-10 minutes or until the onion is soft. Add the garlic, cumin, coriander and cayenne and cook 30 seconds. Add the chicken broth, red bell peppers and chickpeas. Bring to a boil, reduce heat to medium-low and simmer 5 minutes. Puree with an immersion blender until smooth or transfer to a food processor or blender and puree until smooth. (Be careful with hot liquids!) Season to taste with salt and black pepper. Stir in parsley. Heat olive oil in a large sauté pan over medium-high heat. Add the zucchini and cook 4-5 minutes, stirring often or until the zucchini softens to desired doneness. Season with salt and black pepper to taste. Sounds wondefull, i am going to try this tomorrow. You said bake at 165 is this Celsius? Hi, Tamara, That would be Fahrenheit. Cook until no longer pink….will take 20 minutes…perhaps 25. Thanks for reading and let me know how it goes! I substituted buffalo for the chicken and the meatballs were magnificent…Unfortunately I put all of those ingredients into the sauce & I sadly did not get a full finished flavor in the sauce. I think if I tweak it a little it will be perfect. Thank you for sharing this great recipe! Thanks, Sarah! You should always feel free to tweak recipes to your specific taste. I always make sure I use super-fresh spices, too. Wow this is great! Thank you so much! I made slight modifications but overall followed the recipe pretty closely and it’s even more delicious than expected! Saving this recipe! Thank you for the feedback, Anna! Glad you enjoyed! This was so delicious. Would love to know the nutritional information. Hi, Kathi, Thanks so much for the feedback. I use Mastercook to get my nutritional information as a personal chef, but from what I’m told, any nutritional analysis is only an estimate. Some bloggers use programs to come up with a NA, but unless you’re a food scientist or chemist, there’s no way to be 100% accurate. I’m told Self Magazine has a good analyzer. Thanks for your reply, Carol!